very pretty sink! color is gorgeous and excellent quality for the price! these sinks are super stylish and look like a huge upgrade in a home for not a lot of cost! i highly recommend this product! 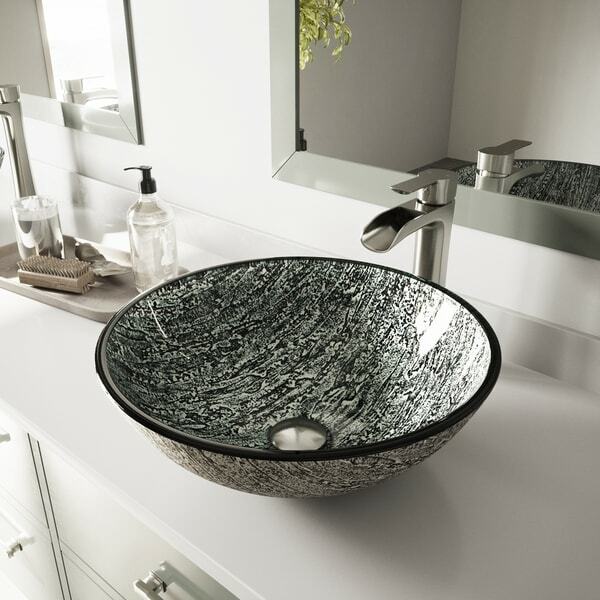 Handcrafted in a durable tempered glass, the VIGO Titanium Glass Vessel Bathroom Sink is ideal for everyday use. The polished interior and textured exterior are stain-resistant and easy to clean. An organic pattern of streaks and lines in glistening silver and black tones add to its wow factor and make this sink a perfect accent to any modern bathroom. Looked all over for a vessel sink this beautiful and found one for under $100 at overstock. It's more beautiful than I thought. Love it. I can't wait to install this sink in our new bathroom. The sink is very sturdy. This sits atop a black granite powder room vanity, and makes the room! The glow when light hits the sink is most attractive. We purchased hardware at another source;no problem to fit. This vessel sink adds just the right sparkle to the bathroom! Exactly what we were looking for! The picture doesn’t do this piece justice! This sink is shiny,silvery, dressy,beautiful. I never get tired of looking at it every time I use the sink. It is not boring at all like white sinks that are classics and have their own place.I replaced this sink with white one I had. i needed some glitter and pizzaz and am happy with it. Anything VIGO is a winner. Great design and awesome product. Very nice, thick, glass bowl. Beautiful sinks. Very contemporary looking! Looks as displayed. Not installed yet, will update with pictures after installed. It didn't fit the counter space, so it went back into the box. Will have to sell it on Craigs List I guess. Needed a vessel sink to make a bold statement in a white bathroom with double sinks....going with a white terrazo glass countertops and contemporary brushed nickel faucets.......looking forward to seeing if it's as nice as the picture. "This sink is ADA compliant and comes w/hardware, which one review said it did NOT. Can I get the waterfall faucet as pictured. Is this sink more black & silver or is there a green cast to it?" Hello Choosey, we do apologize for any confusion. I was to confirm with manufacturer, this item ADA Complaint. This lovely item features a mixture of black and silver, sparkling like a brilliant layer of titanium. Please see Item 16949677 for this item sold as a set, with the matching faucet. Thank you for shopping with us.